For 26 years, dedicated quilters and fiber artists have made the springtime “pilgrimage” to Paducah, Kentucky, for the annual AQS Quilt Show & Contest. Every year generates not only an amazing array of spectacular quilts and enthusiastic quilters, but also new events, exciting developments, and heartwarming stories. Here’s one of those stories. Annabel was a charter member of AQS and met AQS founders Bill and Meredith Schroeder in 1985 when two of her quilts were included in the 1985 Paducah show. That year she won first place in the Other Techniques category with a wholecloth quilt of her own design, and placed third with a different quilt in the Pieced category. In 1986 she entered a wholecloth quilt made from a Stearns & Foster pattern, and in 1991, another wholecloth quilt placed second in Other Techniques. In 1993, a quilted wedding gown Annabel made for her granddaughter received an honorable mention and viewer’s choice in the AQS/Hobbs Bonded Fibers Fashion Show. Her granddaughter attended the show and modeled the gown. 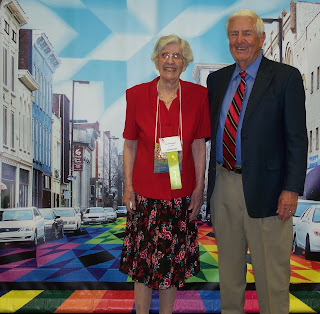 The photo here shows Annabel and Bill Schroeder at this year’s show in Paducah, one of six AQS shows she has attended over the years. Annabel and so many other wonderful quilters like her are what make the Paducah tradition so special. Thank you, Annabel, for being a member of the extended AQS quilting family. I look forward to seeing you at another AQS show soon! Previous PostHow Well Do You Know Paducah?Next PostLook Who’s in the Neighborhood!